Complete plug and play rear wrap around fender tip replacement with 3 LED light pipes illuminated for run function and 12 full contrast brake LEDs. 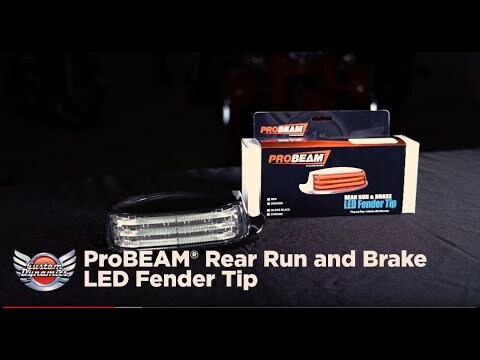 Convert your stock running fender tip light or decorative chrome fender tip trim to a modern run/brake LED light. Sealed unit is complete with connector for plug and play installation behind the stock taillight. Replacement for OEM Part 59672-09. Fits: 2009-2019 Harley-Davidson® Electra Glide®, Ultra Classic®, Ultra Classic® Low, Ultra Limited, and Ultra Limited Low models, 2016-2019 Road Glide Ultra and 2010-2019 Road King® Police models. Use in conjunction with a Magic Strobes™ Brake Light Flasher or Smart Triple Play® to add 10 easy to select flash/strobe patterns when the brake is applied! Additional rear fender tip LEDs available for push-in style Harley-Davidson® rear fender tips. 2009-2019 Harley-Davidson® Electra Glide®, Ultra Classic®, Ultra Classic® Low, Ultra Limited, and Ultra Limited Low models, 2016-2019 Road Glide Ultra and 2010-2019 Road King® Police models. Does Not fit CVO™ models. Bikes included in this fitment may have decorative chrome fender tip that can be upgraded to our LED dual intensity Wrap Around Fender Tip Light. Use in conjunction with a Magic Strobes™ Brake Light Flasher or Smart Triple Play® Unit to add 10 easy to select flash/strobe patterns when the brake is applied!